Facebook has made it clear that it will be taking more aggressive steps to remove misclassified personal profiles used for business purposes. As a result, millions of business owners who are incorrectly using personal Facebook profiles to market their businesses are confronted with two choices: 1) Convert your personal profile to a business Page, or 2) risk getting deleted. It’s not particularly surprising to me that there are holdouts who aren’t going down without a fight. They insist that using a personal profile is better for their business than a Facebook Page. This post is for you. You’re only hurting yourself and your business. There’s a long list of reasons why a Facebook Page is better for you than a personal profile. If, after reading this, you still don’t get it… well… Maybe getting deleted isn’t such a bad thing. 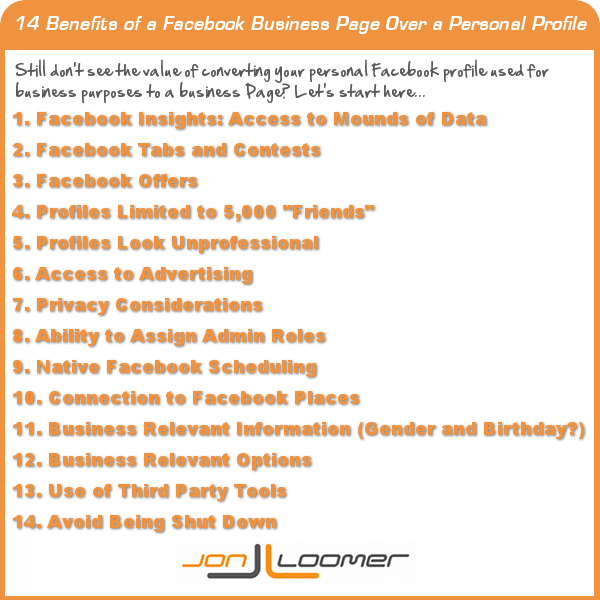 Here is just a sampling of the many benefits associated with a Facebook business Page over a personal profile. Let me get this straight… As a business on a personal Facebook profile, you have no access to Facebook Insights. You are unable to export and digest the thousands of rows and columns of information that can help you understand your customer, what they like and don’t like, where they are from and when they are online. So, what… you go by gut instinct? How exactly do you measure success and failure? If you’re a serious business, you need hard data to drive your strategy. And if you don’t have hard data, you aren’t a serious business. I’m guessing that you look at the tabbed area underneath the Cover Photo of a legitimately-run Facebook Page and think to yourself, Man, what a waste of real estate! With Facebook tabs, you can use apps to explain more about who you are. Provide a video introduction. Feature your products. Provide a newsletter opt-in form. Highlight the history of your company. Without this on a personal profile, how exactly do you do this? You’re limited only to your posts to tell your story and sell your products. Oh, and how exactly do you plan to run contests from a personal profile? You can’t. Not, of course, without violating Facebook terms. But I guess at this point, you don’t care a whole lot about Facebook’s terms. A great way to get some viral buzz going about your business is to run Facebook Offers. It’s an official way to promote a deal you have to your Facebook audience. And when your fans and non-fans claim these offers, their friends see it. Using a Facebook profile? Whoops, you can’t use Facebook Offers. So good luck on your strategy of pasting a link, driving them to your website to promote your deal. If you continue to run your business through a personal profile, it tells me that you don’t have very high aspirations for your efforts on Facebook. Since you are limited to 5,000 “friends,” you are seriously limited by your reach. I don’t care if you’re a small business with only one location. Everyone has plans to grow, and every business should have the potential growth to want to reach more than 5,000 people on Facebook. If you do, you’ll need to scale. I know, I know. You think everyone who “friends” your business appreciates that you are running it through a personal profile. But the truth is that many of us look at it and shake our heads. It looks sloppy. It’s bad planning. It screams, I don’t know what I’m doing! And these are not the messages that you want to be sending to customers and potential customers. Oh, I know what you’re thinking… I refuse to give Facebook a dollar of my hard-earned money! This is probably why you’re using a personal profile in the first place. You think that you’re reaching more people with a profile than you would with your Page. And you believe that your reach as a Page is diminished intentionally to “force” you to buy advertising. You know, that EdgeRank Bogeyman. The truth is that EdgeRank impacts personal profiles as well as business Pages. By default, your “friends” are set to view “most” of your updates (not “all”). Do you think your posts are reaching more than 16% of your “friends” with your personal profile? Prove it. Oh, wait. You don’t have Facebook Insights. If you use a Facebook Page, you can reach more of your Fans and you can reach friends of those Fans with Promoted Posts. 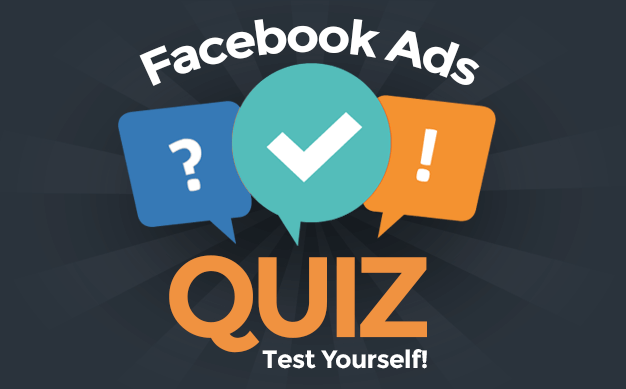 You can create ads that target people with relevant interests and attract new fans and new customers. You can do all of this on a very minimal budget. If you’re serious about growing your business, reaching new people and selling your products, you should be open to Facebook advertising. Most people set their default privacy to reveal a lot of personal information only to their Friends. So when they become friends with businesses, they are revealing this information to them. Maybe you aren’t concerned about the privacy of your customers. Maybe you are ticked by the fact that you have no access to this private information as a business Page. But my guess is that if you were to poll your customers, they don’t want you to have access to this stuff. By using a profile instead of a Page, you’re inviting privacy complaints. If you have an employee or multiple employees who you want to help manage the account, you simply assign roles to them. You would make them “Content Creators” or “Moderators” so that if they leave the company on bad terms, they don’t destroy your business’ reputation in the process. If you need help with advertising, you can also bring in a consultant and assign them the Advertiser role. Or only allow someone to see statistics as an Insights Analyst. What do you do if you are using a personal profile? Give them your username and password. Good luck with that. A great tool is the ability to schedule content within Facebook. I’m using it a ton these days, and it makes my life as a marketer so much easier. If you are promoting your business as a Facebook profile, you don’t have access to native scheduling. Sure, you could use a third party tool, but your posts will always appear with that third party’s formatting and icon. It will be clear that it wasn’t posted from Facebook. It simply looks better when your posts come from Facebook. The difference in engagement may not be huge, but there is a difference. When you set up your business properly, you can also connect your Page to a Place. As a result, the days and hours of operation are visible under your Cover Photo. Very helpful stuff for any customer who comes to your Page. By setting up your business as a Place, customers can also check in, alerting their friends that they are at your store or restaurant. This is a great way to allow your customers to naturally promote your business. Oh, you’re using a personal profile? You don’t have access to this. Maybe you have a separate Place because a customer was nice enough to set it up, but it won’t be connected to your profile. Bad form. From my Timeline, I read this morning that it was [Business X]’s Birthday Today. Well, that’s kinda weird. It’s just silly. When you set up a business as a personal profile, your business now has a gender and a birthday. When you set it up as a business Page, it has a category, a mission statement, products, awards and Founded date. No birthday. No gender. If you want your customer to learn more about your company and what you do, set up a business Page. If you don’t, set up a birthday and gender. Like I said, there’s a long list of benefits to setting your business up as a Page on Facebook. Some of these benefits are small, but they add up quickly. With a business Page, you can restrict your audience by country and age. You have access to moderation and profanity blacklists to control the conversation. You set up your business as a personal profile? No access to this stuff. There are some terrific third party tools out there that help you better manage your business on Facebook. These tools will help you with content management and planning, analytics, contest promotions and advertising. One of my favorite such tools is AgoraPulse. These tools also assume you set up your business the right way with a Facebook Page. Set up as a personal profile? No such access. Let’s assume for a moment that you’ve gotten through numbers 1-13 of this list and are still oblivious. You’re standing firm. You, for whatever reason, still don’t see the advantage of representing your business with a Facebook Page. Well, then risk getting shut down. If running your business through your profile is so great, you will lose something of value. Facebook will take it away. If what you are doing is something worth keeping, you need to convert your profile to a Page. If you are not concerned about that risk, it tells me that your efforts were never worth saving to begin with. What do you think? Are there other benefits to using a business Page over a personal profile? List them below!